The US chemicals industry accounts for about 15% of global chemicals output and employs more than 800,000 people. In 2014, it contributed about 12% to US merchandise exports.Chemicals is a broad ranging sector and an ingredient in a variety of products, touching around 95% of manufactured goods in the US, and is therefore highly exposed to the broader economy and manufacturing activity. 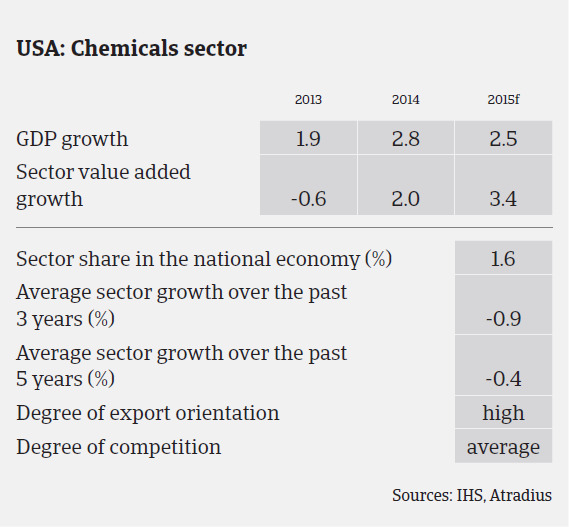 Growth in the chemicals sector typically follows GDP expansion or contraction. The chemicals sector is benefiting from the on-going US economic growth, which is forecast to increase 2.5% in 2015 and 2.8% in 2016. US chemicals production growth is expected to increase 3.7% in 2015 and 3.9% in 2016 (after growing 2% in 2014). The development of shale gas and the surge of natural gas liquids supply has changed the status of the US, from being a high cost producer to one of the lowest-cost producers globally. This shift in competitiveness has boosted export demand, despite the strong US dollar (the dollar has risen 25% relative to the euro since May 2014). It also drives significant flows of new capital investment in the US chemicals sector. Since 2011, the US share of global chemicals industry investment has increased, and this trend will continue. Capital spending has surged since 2011 and amounted to USD 36.28 billion in 2014. It is forecast to reach USD 49 billion by 2019, more than double the level of spending in 2009. The credit quality of US chemicals companies remained stable in 2014. The availability of low-cost natural gas, a key input for many chemicals companies, has led to favourable performance for petrochemicals and downstream sectors (such as the refining and fertilizer subsectors). 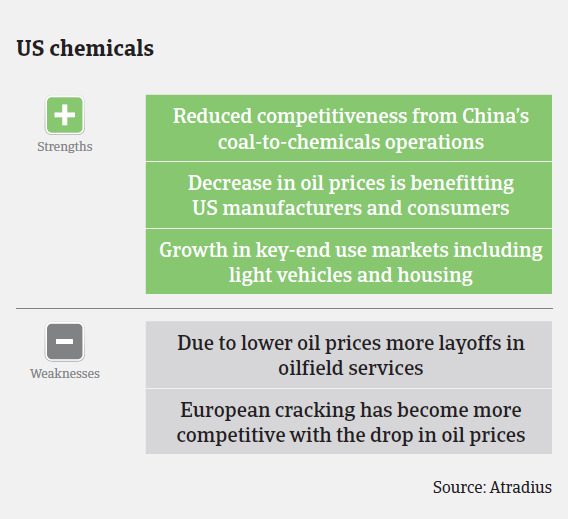 The US petrochemicals industry retains advantages in the global market even as oil prices, and oil-based feedstock prices, decline. Petrochemicals prices have some correlation to oil prices, meaning the current low oil prices will hurt revenues for certain products and companies, but the US industry’s use of natural gas-based feedstock will remain positive. Besides that, the industry as a whole benefits from lower operating costs resulting from cost restructuring, generally high cash balances, and improved debt maturities profiles compared to a few years ago. More than 85% of companies rated within the US chemicals sector have stable outlooks from Standard & Poor’s with a median rating of ‘BB’. US chemicals businesses’ profit margins are generally stable, and the amount of protracted payments in this sector is low. On average, payments in the chemicals industry take between 90 and 90 days. After decreasing in 2014, chemicals insolvencies are expected to decrease further in 2015. Our underwriting approach to the chemicals sector remains generally positive to neutral. As the sector is highly fragmented and dependent on the broader economy and input costs, we scrutinise single subsector trends and end-markets. While being more relaxed on the plastics subsector, the energy subsector generally requires a more cautious underwriting approach due to the lower oil price. Access to financial information is difficult, but is essential when considering large deals. 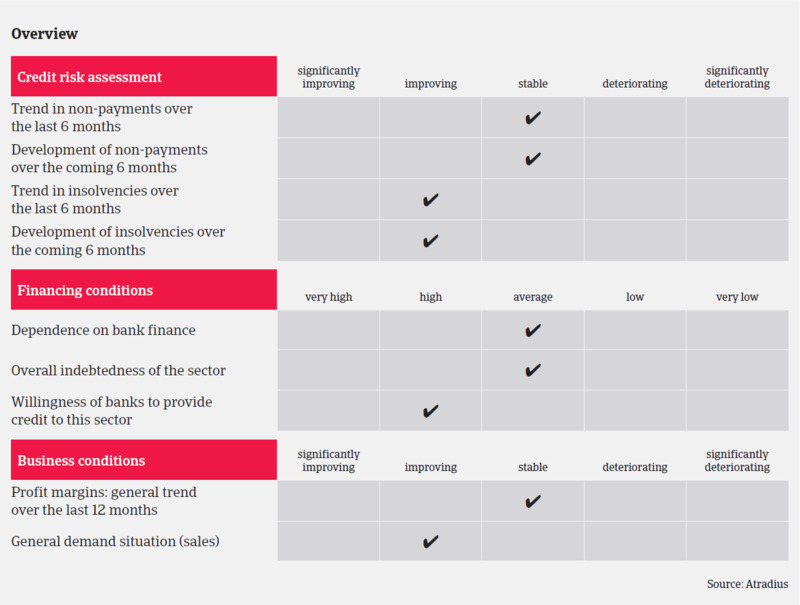 We continue to review distressed risks on a quarterly or bi-annual basis and use both third party credit agency information and confidential credit sources to support our assessment of the appropriate level of cover.